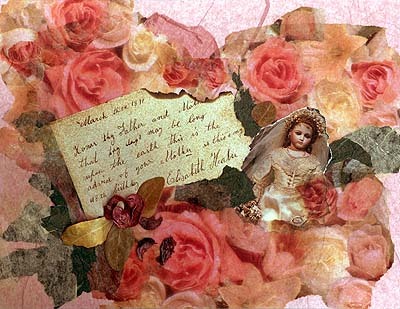 This paper collage was inspired by a page from my grandmother's girlhood autograph album, signed by her mother. In March 1891, Elizabeth Haber wrote, "Honor thy father and mother that thy days may be long upon the earth. this is the advice of your mother as this is my 48th birthday." My grandmother lived to be 102, so she must have taken her mother's advice. First I scanned the album page and saved it in a sepia color, then burned the edge to age it even more. I applied the page, colored wrapping tissue and a magazine clipping to illustration board with Golden Soft Gel, then adhered some bits of potpourri with regular gel.